Our church was able to send several staff members and attenders to the 2018 Women Doing Theology conference held this past weekend on the campus of Anabaptist Mennonite Biblical Seminary in Elkhart, Indiana. The Women Doing Theology conference came to be from the Women in Leadership Project of the Mennonite Church USA. The Women in Leadership Project, in their own words, "works to dismantle patriarchal systems in Mennonite Church USA by empowering women to live out the call of God on their lives, increase their capacities, and contribute their wisdom in congregations, area conferences, agencies, and institutions." In addition to the WDT conference, the Women in Leadership Project also cohosts a podcast with The Mennonite, Inc. called Holding it(,) Together. "When I registered for the Women Doing Theology conference, I expected to have a good time connecting with, worshiping with and being inspired by other women. What I didn't know was how deeply I would be transformed and shaped by this experience. Imagine looking around a sanctuary, packed with women of all different ages, cultures, ethnicities and sexual orientation-- all passionate about faith, justice, and loving God with our lives. We sang, we laughed, we listened, we shouted. We were silent. We cried. We prayed. We heard that God lives in the margins, with those whom society has dismissed, pushed down, or set aside. The epitome of this conference, for me, happened in the last worship service. As we shared communion together, we passed around a basket of tortilla triangles. About two-thirds of the way back, I noticed the ushers were whispering nervously to one another, "We've run out! Are there more?" There was scurrying and some anxious looks as it appeared that not everyone would be able to partake. One by one, women noticed the need. Without a word, some began ripping our tortillas in half- keeping half, and getting up to place the other half back into the basket. As the refilled baskets finished making their way through the remainder of the seats, at one point an usher held up a basket and announced loudly, "We have some left over!" and the sanctuary erupted in cheers, laughter and praise. It was the miracle of the feeding of the 5,000 right in our midst. We are already looking forward to attending WDT20 in two years! Our church recently wrapped up a a 3-year constitutional review process. As you can imagine, this resulted in many changes for us including the ways in which we meet and communicate with one another. How can we best use our time and talents in a way pleasing to God while also being mindful of the time we have committed to obligations and responsibilities outside the church? What's the best way to gather our entire ministry team, staff and volunteer, together for face-to-face conversation and discussion of issues outside and within our congregation? Enter the Leadership Summit -- a 3 1/2 hour gathering twice a year of all of the leaders within our church. We have just completed our fourth summit and are continuing to work out how best to use this time. So far, we have used it to discuss a church-wide Listening Process within our assigned ministry teams, review church logistical and educational information, introduce new leaders to one another, gather input on a certain topic, disburse gifts discernment results to our ministry teams, and team build. Although we have an agenda for every summit, it is not always the same agenda. One of the best things about this twice-yearly summit is the flexibility we have given it to fit what is currently happening in the life of our church. While everyone on the leadership team sees each other throughout the year, these summits are usually the only gatherings where every leader is together. There's just something about bouncing ideas off the whole group face-to-face that doesn't happen in email or within smaller groups. Having a focused leadership time outside of our normal leadership obligations has also been very beneficial to us as we can cross-collaborate with other ministry teams "on the spot" and really build up a lot of momentum for an idea in a very short amount of time. Just like everyone else, carving a whole Saturday morning, once in the spring and once in the fall, out of our schedule is difficult with all of the other to-dos on our list. We are reaping the rewards, though, and are excited to see how it could continue to benefit us for many years to come. Last month, I got to walk the trails at Camp Friedenswald. To stand in the shade of the towering red oaks. 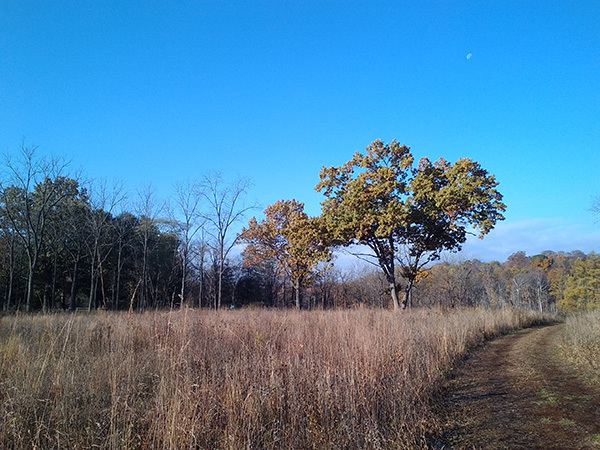 To soak in the late afternoon light on the prairie and oak savannah. To come upon a “kettle pond” created thousands of years ago at the melting of a glacier fragment. In such a place, the beauty and diversity of God’s creation speaks! It is good! The event that took me to Friedenswald was a workshop for Mennonite pastors on climate change, led by Doug Kaufman and Amy Huser. Not only did we celebrate the creation around us, we also heard about the impact of climate change in Indiana and globally. We talked about our responses of denial, despair, and feelings of being overwhelmed with this change that affects all in our global home. A highlight of the event was hearing from Mennonite Central Committee partners from Zimbabwe, El Salvador and Nepal. Each of these leaders, Durga, Zacarias and Sibonokuhle, are working with communities living in poverty whose lives have been severely impacted by prolonged drought and decreased snow line (Nepal), intense rain and drought leading to social crises (El Salvador) and severe heat waves, dwindling resources, and increased conflict (Zimbabwe). For me, this put a whole new face on climate change. These three courageous leaders are walking with their communities through incredible change that wreaks havoc on families already struggling in poverty. They urge US Christians to pay attention to their struggles. In their testimonies, I heard the need for faith in God, the Creator, along with a call to follow Jesus in radical discipleship that considers the needs of the planet and the people of earth. Such a time as this calls for faith in God alongside responsible human action. This article originally appeared in the October 2018 edition of Kern Road Mennonite Church's electronic newsletter Kernels. Why does a church in South Bend, Indiana make and sell Kenyan samosas every year, anyways? Kenyan Samosa sales were started about 5-6 years ago by the our Global Partnership Forum group with support from the Service Committee at the time as a way to affirm the talents and gifts of the Kenyan families in the church. 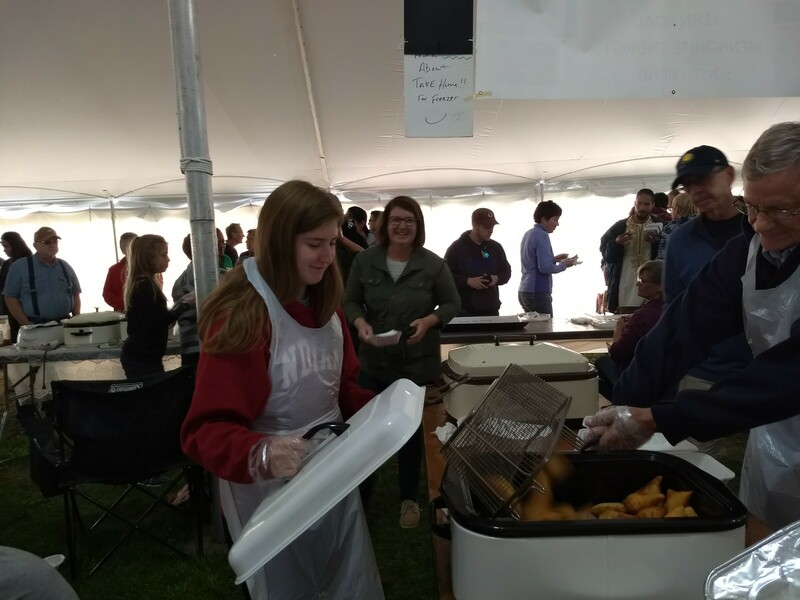 The Mennonite Central Committee Relief Sale had started an International Foods tent, and we thought Kenyan Samosas should be represented. 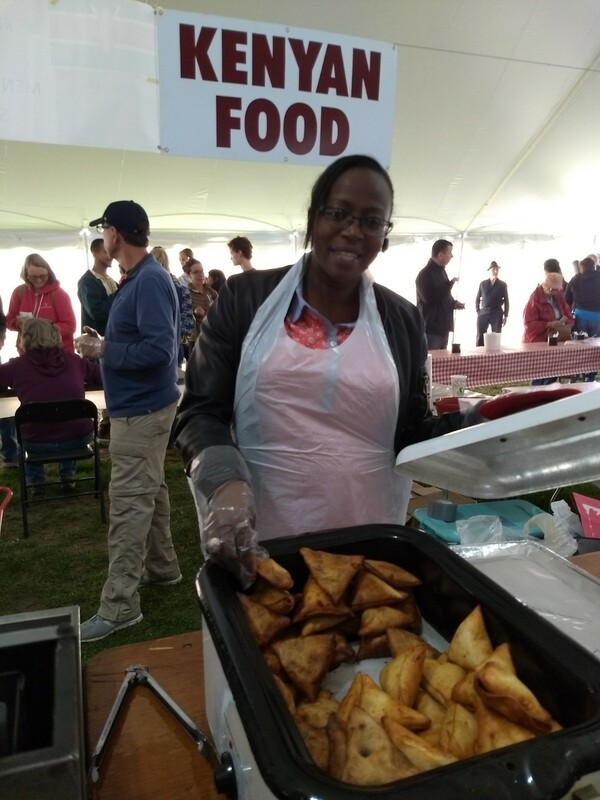 Since that time, the Kenyan women in our church have cooked, taught, and helped orchestrate the creation of authentic samosas, both meat and veggie-filled, to be deep fat-fried and sold at the annual Relief Sale. This year our junior high and senior high groups and their parents had a samosa-making party one Sunday evening and made over 300 samosas in a couple of hours! All the funds collected goes to Mennonite Central Committee world relief and development. The church makes no money for itself on these and often much of the ingredients and certainly the labor is donated by KRMCers. This year's sale brought in $5468 for MCC. We are a church in Indiana that makes and sells Kenyan samosas because we are part of a global body of believers that loves and respects all cultures, countries, and traditions... especially delicious traditions like samosas! Several of our staff members attended an all-day conference on racial justice this week. We found the following resource from the Catalyst leadership conference in 2016 to be especially eye-opening. We hope you will find it helpful in some way as well. I’ve been driving Kern Road/CR 28 between South Bend and Goshen a fair amount during the last few weeks for various reasons. 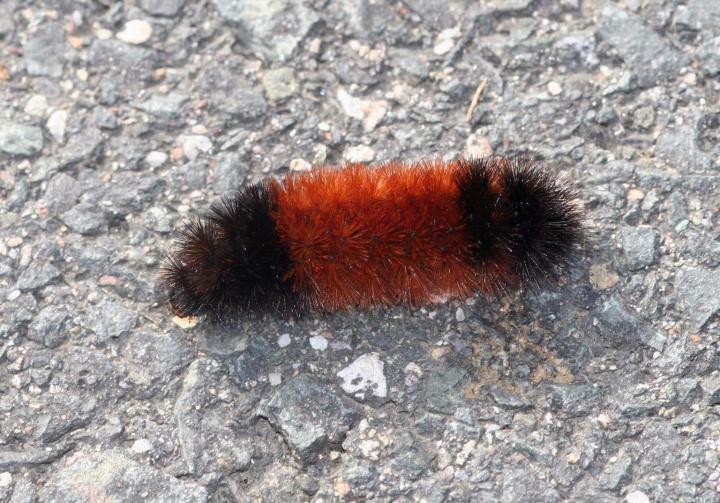 Has anyone else noticed the rusty brown, black wooly bear caterpillars crossing the road? Watch the pavement for dark moving spots. Some hot days I see lots of them -- like a wooly bear invasion. The fact that you can see them move at all when the car is moving so fast is amazing. I wonder where they’re going and why. Why are they so determined to cross the road? Why would they take such a risk? Don’t they know there are giant cars (and tractors) with rubber tires traveling this road -- some at speeds of 50, 60 (probably even 70) miles an hour? They could be crushed. Some probably are. I went to the internet. It seems in late summer. wooly bear caterpillar eggs hatch. Now is the time of year when they move to find a prime place for winter (preferably under a rock or log). 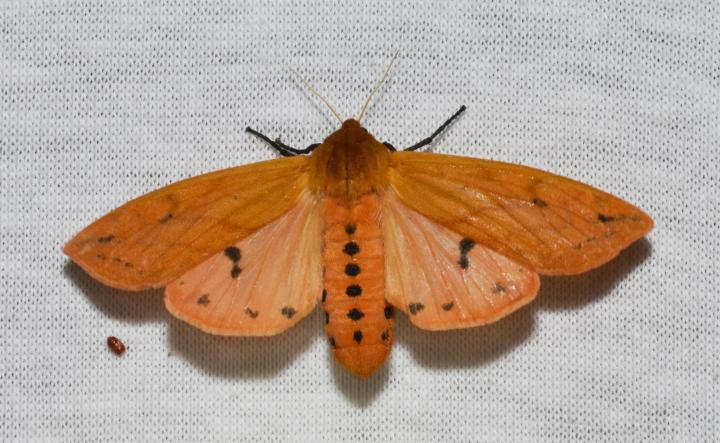 When the weather warms in spring, they spin a cocoon and eventually transform into an Isabella Tiger Moth. The wooly bear is one of the most recognized of caterpillars because of its fuzzy appearance. Semi-scientific studies were done in the 40-50s on these caterpillars. Some still say you can predict the harshness of an upcoming winter by the length of their brown segment. There are still fall festivals in the US hosted to “predict” the upcoming winter according to the stripes -- kind of like how Punxsutawney Phil predicts the end of winter in PA. More recent studies are showing there really may be a link between the wooly’s brown segment and a winter’s harshness but the correlation is more likely to be a statement of the harshness of the past winter than the upcoming one. So I did learn something but I still don’t know why they need to cross the road. Can’t they find a quality log without the danger of crossing the road? Maybe they sense this particular phase of life is going to be short and they want to see and do as much as possible while they can. Following their instincts, they are preparing for the next life phase, and they are ready and willing to live a little dangerously! I find myself identifying a bit more now with the sense of life’s brevity. This summer I celebrated both my sixtieth birthday and 30 years as one of a number of pastors in Kern Road’s history. I’m starting to feel life is shorter than it used to be. It’s hard to believe how quickly these years have passed and how much change has occurred in that time in my life and in our congregation, community, and world. I know I’m sounding really old now. But I’m pleased to say that as I think about our congregation, I can think of a number of times along the way that we have taken some risks. We have not always chosen to go the way of other congregations or the culture, and we have crossed some roads that have opened ourselves to be transformed into something new. It would be my hope that we can retain some of that spirit of risk and adventure especially if it helps us to live our witness to the love of God in the world as lived by Jesus Christ. That would need to be the impetus, the purpose. September and the months of the fall are an exciting time of year in our congregation. We settle into a more regular routine after a more scattered summer. We often welcome new attenders as we are this year. We make samosas and bring our coins to participate in the Relief Sale. There’s a church retreat coming up in November. Exciting new formation opportunities for all ages are on the horizon. Youth Advocate breakfasts return. A new worship series began last Sunday. Area groups meet. Most everyone is around as our families and young adults are back from summer and our retirees have not left us for the winter. What are the new risks we should take? As members of Christ’s body, I give thanks for the seasons of life, for reminders in creation of the cycles of life, of risks taken and hardships endured. As we enter the fall of the year, I invite you to join me and the wooly bear caterpillar: not afraid to leave life as we have known it behind, willing to take risks of faith in an unknown future, crossing new roads to discover new habits(ats) and new life phases with expectations of joyful transformation and opportunities to participate in greater witness to the risen Christ. I’m still amazed at how distinctly one can see those little rusty brown and black caterpillars moving across the road in such a rapidly moving vehicle. This gives me hope that one congregation’s witness to our Creator can be seen and make a difference even in a fast-paced, complex, often harsh, and unjust world. And did you get what you wanted from your life even so? And what was it you wanted? To feel myself Beloved in the Earth. It is the evening of a satisfying working day, harvesting, weeding, and watering. I picked blueberries. I was surprised by a couple of quarts of the first green beans ready for picking that I hadn’t noticed before. Abby dispatched a groundhog that was investigating the area around my garden! I made a delicious meal from our own wealth of produce: beef, onions, the green beans, garlic, tomatoes, cucumbers and tomatoes. I rode bike on the eight mile loop, then sat outside under the mackerel sky, at first reading about soil, then just watching the sky as the light faded and John and Murray finished stacking the lumber made today from culled ash trees. I watch the swallows wheel and soar around the barn catching last insects, and the dogs wrestle and then rest, heads erect, Blue with one foot precisely behind the other, Abby scanning the farm. I am one with the blue sky, the grass and the borders of trees. I am one with the Japanese beetles (which I drown in a bucket) that eat my roses and peach tree foliage, and with the flock of fluttering white butterflies, and with their larva that eat my cabbages which I defend with BT. I am the phoebe, and the bluebird on the electric wire, and the destructive bittersweet vine, and the gorgeous trumpet flower vine, and the sweet smelling nicotiana. And this status comes to me by my attention and care for all these things, my acceptance of labor, rest and quiet. Someday I will become one, not only in spirit and by my love, but physically, when my body nurtures the earth that has nurtured me, held in a new form in this Beloved and loving Earth. This originally appeared on https://restorationfarm15.wordpress.com. 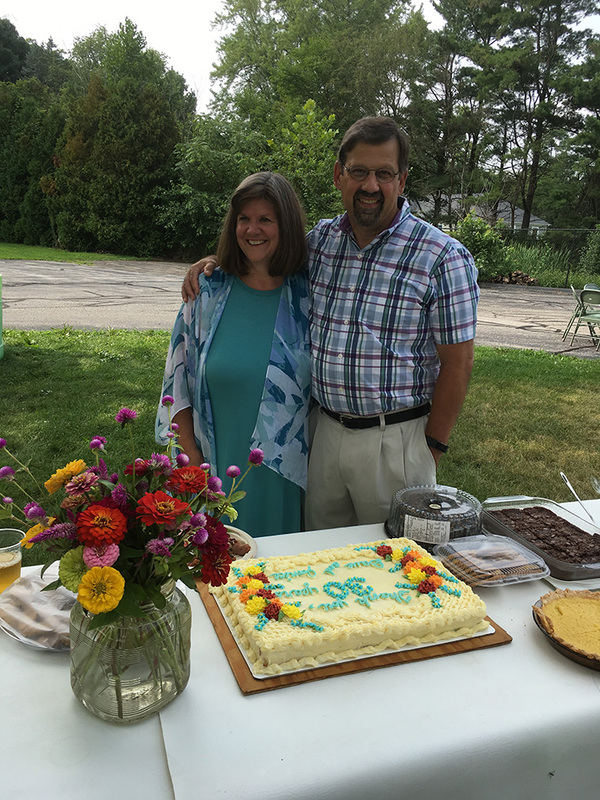 Our co-pastors, Dave & Janice Sutter, have served the KRMC community for 30 years this month, and we couldn't think of a better way to celebrate this milestone than with a party! We hosted a hog roast on the church grounds with plenty of yummy potluck sides and desserts, music, singing, fellowship, laughter & fun! After the meal, we went inside to participate in a hymnsing and program highlighting all of the wonderful contributions and memories Dave & Janice have made with us as a congregation. We look forward to seeing how God continues to bless them and us as we move forward into our 31st year with them at the helm.